(Bloomberg) -- Deutsche Bank AG is wary of Commerzbank AG’s credit quality as merger talks commence, assessing whether the smaller rival has been rigorous enough in handing out loans, said people familiar with the matter. Deutsche Bank may be forced to write down Commerzbank’s loans after a tie-up if the larger lender applies tougher risk models, potentially creating the need for additional capital, the people said, asking not to be identified discussing the private deliberations. It’s not yet clear how much capital such a revaluation would require, they said. The two lenders have recently opened formal talks about a merger and are currently going through each other’s data to assess possible risks and determine an appropriate price. The question of how much new capital may be needed will be crucial if a tie-up makes it necessary to revalue assets on the banks’ balance sheets. Mergers usually trigger a revaluation of the assets on the target’s balance sheet. If the holdings are recorded at a higher price than their current market value, the new book value will be lower, triggering a writedown. That typically hurts the company’s bottom line and will therefore reduce its equity, making additional capital necessary to maintain adequate capital strength. Deutsche Bank fell 0.7 percent to 7.46 euros during early trading in Frankfurt, while Commerzbank declined about 1 percent. Commerzbank Chief Financial Officer Stephan Engels has repeatedly highlighted the “high quality” of the lender’s loan book. Still, the bank recently said it expects loan-loss provisions to rise by at least 23 percent this year. The lender on Wednesday said it expects revenue and profit to grow this year while warning of a difficult environment for banks. Deutsche Bank delivered a similar message earlier. Deutsche Bank Supervisory Board Chairman Paul Achleitner said Wednesday that the bank will give a public update on the merger talks with Commerzbank by April 26. 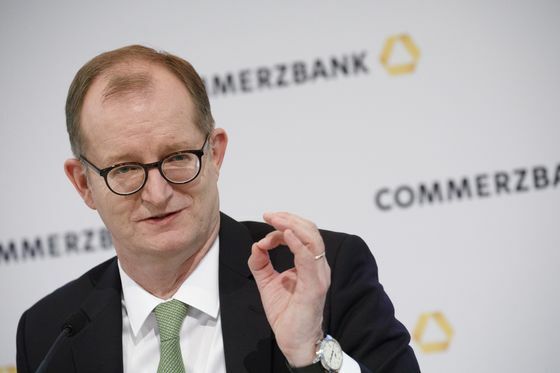 Commerzbank Chief Executive Officer Martin Zielke has said that he wants a quick decision on whether to go ahead with the tie-up. Some key shareholders of Deutsche Bank, notably the Qatari investors, are skeptical of a potential deal because it may force the bank to issue new shares to finance it, diluting existing investors in what’s already an extremely depressed stock, people familiar with the matter have said. The Qataris first invested in Deutsche Bank about five years ago when the share price was about four times as high.